Gestation for gorillas is 8½ months long. There is normally 3 to 4 years between births. Infant gorillas live with their mothers for around 3-4 years. Females usually mature when they are 10–12 years of age, but mature earlier in captivity. Males mature between 11–13 years old. Average lifespan is within 30–50 years old. The longest recorded lifespan of a gorilla was 54 years, set by Massa at the Philadelphia Zoo. 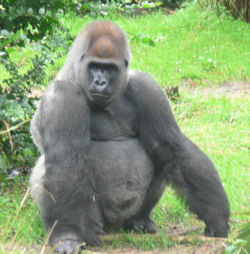 Unidentified gorilla. Wild animal park, San Diego, California. This page was last modified on 8 December 2016, at 18:06.